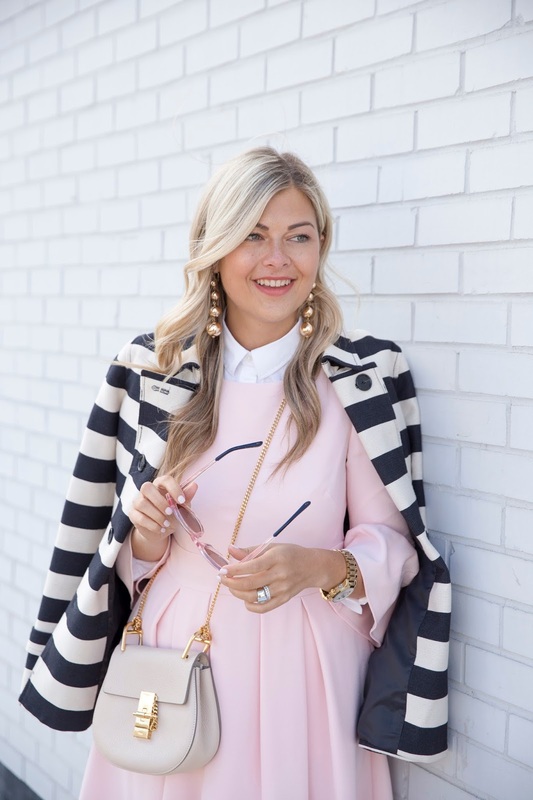 Nothing gets me tickled pink like the perfect wear to work dress with bell sleeves and the right hue of pink. I ADORE this option from Eliza J for spring. I've been wearing it with a a long sleeved shirt under for layering (and with tights!) but I can't wait till it's warm enough that I can do without. I'm also loving how great it pairs with pumps but also kitten heels! Such beautiful styling! The gold accessories add the perfect classic touch to this girly dress, and I love how you mixed prints with your striped jacket and those adorable leopard heels! Great minds think alike - lol! Love how you styled this look! Unreal outfit! I love the leopard block mixed with the pink and the striped jacket. Flawless!! You are still so sunkissed! I love this mix... I have a stripe jacket similar and never thought to pair with leopard! How adorable! Always looking outstanding!! Your dress is wonderful and suits you perfectly! This is such amazing styling from the pink sunnies to the stripes to that leopard! Just gorgeous. I am seriously loving all your pink outfits! This dress is so pretty!